Work includes removal of masonry to expose the lintel, preparation of the adjacent surfaces, flashing installation, drip edges, cotton rope weeps, galvanized and stainless steel lintel installation and rebuilding of adjacent masonry units. Window openings deteriorated beyond repair require rebuilding. This work ranges from resetting loose masonry in new bedding mortar to creating square openings out of rough deteriorated conditions. Create new rough openings to add doors and windows to existing wall faces. Sills and heads range in material from brick, limestone, sandstone, slate, granite, etc. This work includes rebuilding of jack- and flat-arched brick. These materials all require a unique approach. 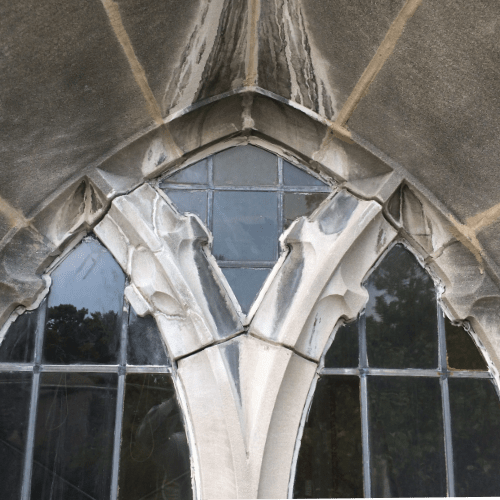 Marion repairs cracks and spalls in stone, replaces spalled and fractured brick, and custom fabricates stone units deteriorated beyond repair. Installation of sealants at the termination edge between the actual window and masonry is key to preventing moisture infiltration. Marion installs colored sealant to match either the masonry mortar or the window color; whichever is the most visually acceptable.